Historically, 107 West Market Street dates back to the 1880's and has been a home to many of Danville's well known ancestors: the Baldy, Wooley, and Wells families. Local people also knew this historic home as a physician's office. From the late 1950's to the early 1980's, Dr. William Curry was the physician to many of Danville's residents. Those who passed through the doors of the Queen Anne Victorian style home left with a bottle of elixir and toting a prescription for better health. Today, The Doctor's Inn offers an invitation for rest and relaxation where guests may escape the fast paced world and become reacquainted with the Victorian Era. The craftsmanship of an ornate mahogany staircase, high ceilings, pocket doors, and romantically spacious, yet carefully decorated bedrooms, will send you back in time. Guests may gaze across the brightly lit borough at night, enjoy a delightful breakfast, relax among the backyard gardens, or stroll the streets of downtown Danville. Those who visit may learn that this combination of history and relaxation is just what the doctor ordered. Guests will be treated to a unique experience at The Doctor's Inn for your special occasion. Imagine your bridal & baby showers, birthday and tea parties, business gatherings, church groups, and other social events set in Victorian splendor. We can also arrange to cater your special event. Please let us know your catering needs when you make your special event reservation. An overnight stay is not required. Pricing for special events will be based on your individual needs. It would be our pleasure to create a one of a kind occasion with you. We serve a full breakfast daily. Please inform your host of any special dietary restrictions or food allergies. The Curry room is a spacious room that offers a king size, four-post canopy bed, a comfortable sitting area, and a private master bath with two person whirlpool tub and a separate shower. A home-made breakfast is served in the dining room for our guests. Free wireless internet access is available for all guests. The Nursery Room features a queen size bed and private bathroom. 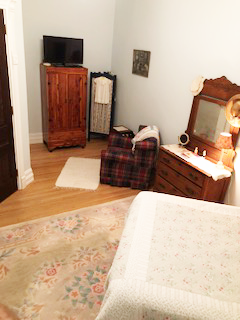 It is a quaint and relaxing room with touches from children of the Victorian Era. Guests may enjoy a home-made breakfast served in the dining room. Free wireless internet access is available for all guests. 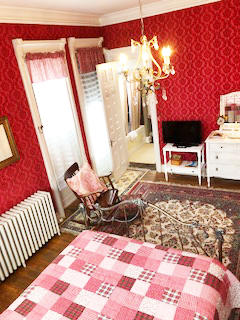 The Grone Room offers a queen size Victorian, wrought iron bed and a private bath with a whirlpool tub and shower decorated in marble and Victorian style. Vintage wallpaper and furniture beautify this room. A home-made breakfast is served in the dining room for our guests. Free wireless internet access is available for all guests. The Recovery Room is decorated with calming colors and prints to encourage relaxation. 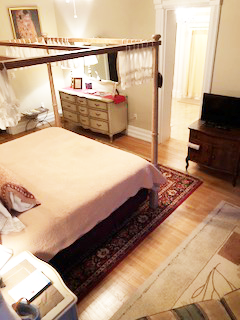 The queen size four post pine bed and private bathroom give this room a fresh cottage style. There is a kitchenette just outside of this room for your convenience. 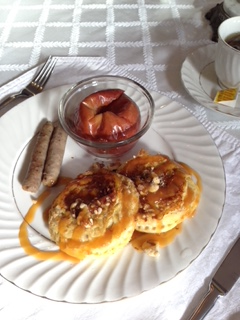 Guests may enjoy a home-made breakfast served in the dining room. Free wireless internet access is available for all guests. Located 3 miles from Route 80 in the West Market Street historic district of Danville, Pennsylvania. Restraunts, wine tasting and shopping are within walking distance. Reserving a room at The Doctors Inn implies consent with the following terms and conditions. For the safety of our guests, the use of facilities is limited to registered guests only. Please add 6% sales tax and 3% hotel tax to all above rates. Payment: Cash, AMEX, Visa, Mastercard, and Discover are accepted. Personal checks are acceptable for advance deposit only and must be received 30 days prior to arrival. Personal checks will not be accepted upon check-in. A credit card number must be given at the time of reservation, even if the guest will be paying by cash. Deposits: A 50% advanced deposit for the length of the guests stay is required when making a reservation. Payment for entire stay is expected upon the guest's arrival. Payment in full is required 30 days prior to the guest's arrival for: holidays, graduations, special event weekends, reservations of two or more rooms, and stays of five or more nights. Deposits are not transferrable to future reservations. Check-In: Check-ins can start at 2:00 pm (or by special arrangement prior to arrival date). Arrivals outside of check-in time may require a self-check-in by the guest. Check-Out: Check-out must be promptly by 11:00 am. There will be a $50.00 fee for a late check out between 11:00 am and 12:00 pm. Checking out after 12:00 pm will incur a charge for another day. All guests are responsible for any damages incurred during their stay. Damage reported or unreported will be charged to the guest's credit card. Cancellation: Vacancies caused by early departures are considered to be cancellations and full payment of reserved stay is expected. If a guest decides to check-out early, no refund full or in part will be given. The guest can cancel free of charge until 14 days before arrival. The guest will be charged 30% of the total price if they cancel in the 14 days before arrival. Smoking: The Doctors Inn is a Smoke-Free facility and we are proud to offer a smoke-free environment to our guests. Smoking is not permitted in guest rooms, indoor or outdoor public areas, or anywhere else on our grounds where it may impact other guests or pose a fire hazard. We will assess a $450 fee to the guest's credit card for any violations of our no smoking policy. If the room is damaged or requires an excessive amount of cleaning, an additional cleaning fee will be assessed to the guest's credit card at a minimum hourly rate of $75 per hour and any damages will be assessed by the cost of the repair or replacement. Fire Hazards: No open flames in the rooms as required by law and for the safety and security of all of our guests. We prohibit the use of hot plates or food preparation in the guest rooms. There is a microwave in the common area for guest use. Children: Well behaved supervised children. Pets: We are ultimate animal lovers; however for the safety, comfort, and convenience of all of our guests, we regret that we do not allow pets. Exclusivity: The Doctors Inn, its rooms and its included amenities are for REGISTERED guests of The Doctors Inn only. Innkeepers are always happy to give tours for visitors. 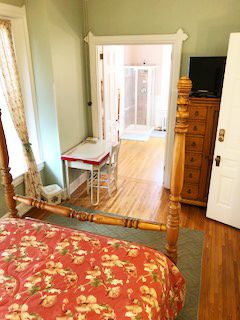 For the comfort, convenience, and respect of privacy for all of our guests, we ask that guests do not bring in visitors, friends or family without pre-arranging with your innkeepers. Parking: The Doctor's Inn has on street parking along the property in front or along side. Most of the times there is amble amount of parking spaces.